I am in the process of loading up another jar with 936 marbles for a new dad. 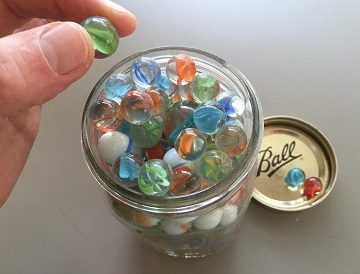 I pray that at some point in our ministry that we can do this for every first-time dad – give him a jar of marbles as he and his bride leave the hospital to start a new chapter in marriage as dad and mom. (For a refresher on what this is about, click on: Losing Your Marbles). On the front end, the 936 weekends dad has before the child turns eighteen seems like a long time. On the back end when the jar is empty, every dad wonders where the time went – you remember holding her in one hand; teaching him to throw a ball; giving her “up-hugs”; guiding them in relationship with Jesus; wrestling with him; helping her learn to drive; and watching them step away into their own lives. How did the time get by so quickly? Intentionality on the journey is a dad’s responsibility. Fathers, do not exasperate your children; instead, bring them up in the training and instruction of the Lord. – Ephesians 6:4. The second half of this verse is key. The home is to be focused on bringing children up in the training and instruction of the Lord. A family grounded in the word of God will keep the influence the world works to have over the home in perspective. Exasperation often times is due to the abdication of this responsibility to daycares, churches, schools, peers and media. Kids indeed respect parents being intentional in their efforts to stay engaged and refute distractions that may be unhealthy influences in their lives. In fact, youth in the church and beyond are crying out for parents to talk with them and provide clarity on edgy topics they face daily. In My Utmost for His Highest, author Oswald Chambers referenced Jesus walking beside the disciples on the road to Emmaus (Luke 24:32), “Suddenly Jesus appears to us, fires are set ablaze, and we are given wonderful visions; but then we must learn to maintain the secret of the burning heart – a heart that can go through anything. It is the simple, dreary day, with its common place duties and people, that smothers the burning heart – unless we have learned the secret of abiding in Jesus.” Dads and moms have their hearts set ablaze with the miracle of childbirth. Wonderful visions and dreams for their children abound. That jar of marbles serves as a visual reminder of how easy it is to get distracted by the day-to-day common place duties. Years can pass quickly. Dad must provide a home that abides in Jesus and rebukes anything trying to smother the burning heart needed for kids to catch a personal relationship with Christ. A generation is in the balance. Prayer guide: My Father, thank You for the opportunity to be Your representative in family. I confess I have abided in the world across the week and just visited with You on Sundays. I have lost a lot of marbles abiding more in my work, friends and other interests than in my relationship with You and my family. Forgive me. Help me abide in You daily. Strengthen my relationship with You and teach me to live that relationship in marriage. By Your grace, I will commit to be intentional in efforts to bring my family up in the training and instruction of You. Guide me and be with me Jesus. Amen. A faithful father is intentional about abiding in Jesus every step of the fathering journey. Great message today. Thanks. Reminds me of how family time is so precious. I love the marble idea!